The game started by another name, Alien Fear, but that's not all that has changed for the upcoming PC, Xbox Live Arcade and PlayStation Network title now called Alien Rage. While originally the game was slated to feature some sort of cooperative gameplay, we can confirm now that we have a review build in our hands Alien Rage does not feature co-op play. In fact the PC version of the game is the only version to feature any sort of multiplayer, which will be competitive in the form of deathmatch and team deathmatch. 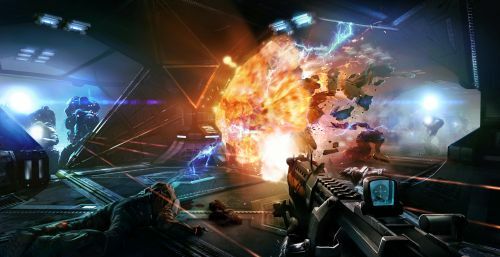 The single player game appears to play a bit like Bulletstorm with a focus on quick action and high scores. Alien Rage will reach PC gamers on September 24 for $19.99 and will be available a few weeks later as a single player game on XBLA and PSN for just $14.99. As a reminder this happens from time to time with games, our official way of handling it is to keep the game in the database marked with 0 players supported. We then mention in the description that co-op has been dropped or something similar.